AppConnect NW is a consortium of seven community and technical colleges in the Puget Sound. Each college offers an applied baccalaureate degree in application/software development. The faculty have joined together to collaborate on developing industry partnerships and common curriculum in order to create more opportunities for graduates to succeed. The National Science Foundation (NSF) has awarded an $800,000 grant to five community and technical colleges in the state of Washington: Lake Washington Institute of Technology (LWTech), Bellevue College, Green River College, North Seattle College, and Renton Technical College. 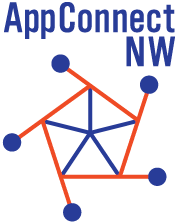 The NSF grant will fund the collaborative Northwest Network for Application Development and Technology Connections (AppConnect NW) project. AppConnect NW benefits the IT industry with a responsive network of faculty willing to adapt their programs to meet changing technological demands and a pool of highly skilled, diverse graduates prepared with knowledge shaped by industry. Opportunities include evaluating curriculum and advising faculty on ways to align with industry standards, serving on one industry advisory committee that serves seven colleges, and supporting interns to cultivate soon-to-be-graduates into your company’s culture. Connect your company with more than 300 tech students. Students gain from the consortium with an educational program in line with industry demands and an opportunity to create connections with industry before graduation. Explore options for starting your degree today. WTIA is Washington state’s unifying voice for the technology community. We mobilize industry, education and government to make our region the leading technology community in the world. Become AppConnect NW's industry supporter today! AppConnect NW is a consortium of seven community and technical colleges in the Puget Sound.